“I first noticed that I was getting breathless aged seven, at a primary school sports day. After that, I became breathless all the time, even when I was sleeping. It got so bad I was waking up in the middle of the night coughing and struggling to breathe, needing my inhaler. “I started learning the bagpipes when I was eight. No-one in my family plays an instrument but I have always loved the sound of the bagpipes, and a piper at my dad’s work offered to teach me. “The bagpipes were difficult to learn at first, as you need strong abdominal muscles to play and it takes a while to build them up. But I played my pipes for 30 minutes every day. Most of the time my asthma didn’t affect playing but if I had symptoms and couldn’t play the full pipes for that long, I still practised on my chanter [a practice instrument like a recorder] – nothing was going to stop me! “For the last six years, I have been touring with my band, the Red Hot Chilli Pipers. We travel worldwide and perform high-energy shows which are up to two hours long. If piping didn’t help my asthma, I wouldn’t have been able to pursue the career of my dreams. I feel great now! Playing a woodwind instrument has also helped me to keep fit and exercise with ease. I can pinpoint my first symptom of asthma to around the time of the 9/11 tragedy. It all started when I noticed a change in my breathing “ I found myself coughing a great deal, having trouble catching my breath and felt tightness in my chest. I brushed my symptoms off as a result of stress and anxiety from the recent events and didn’t give them much more thought. It wasn’t until several years later while filming the show Pushing Daises that my symptoms took a turn for the worse and I started to notice the impact they were having on my career. While at home visiting my parents in Oklahoma, my mom noticed how sick I had become and urged me to see a doctor in my hometown”it was there that I was diagnosed with adult on-set asthma. As a singer and actress, being able to breathe properly is a critical component to my success, so needless to say I was devastated when I received my diagnoses; however, I was also grateful to finally know what was causing my symptoms. Although it took some time, I eventually grew to accept the fact that I had asthma and worked closely with my doctor to determine a way to safely manage my condition. With my busy, on-the-go lifestyle, my doctor prescribed me a rescue inhaler with a dose counter, which keeps track of how much medication I have left. Now, whether I’m on stage, in the studio or traveling to my next gig, I can feel confident in knowing that I have enough medication on hand when I need it most, such as during an asthma attack. 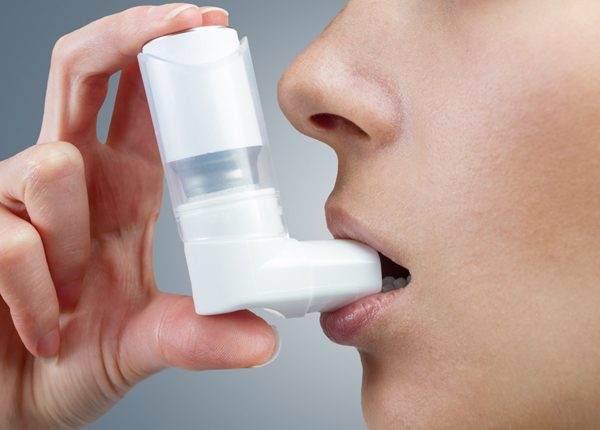 It’s no secret that managing asthma as a professional singer can be extremely tough. I can recall one instance during my career where my asthma symptoms started to get the best of me and I had to sneak off stage to use my inhaler. Fortunately, that’s not a regular occurrence, but it taught me to always be prepared. In addition to my rescue inhaler with a dose counter, I have to be really smart about recognizing the onset of my symptoms. I learned the hard way that avoiding or ignoring your asthma symptoms is not the way to go and can’t emphasize how important it is to listen to your body when it’s telling you something is wrong. After struggling with asthma in silence for more than a decade, I decided it was time to share my story in an effort to show other people living with asthma that the disease does not have to limit you from doing what you love. When I was approached by the Asthma and Allergy Foundation of America (AAFA) and Teva Respiratory last year to partner with them on a new public service campaign called Know Your Count, the timing just felt right. Know Your Count aims to raise awareness of the seriousness of asthma and educate those living with asthma and their caregivers, about the importance of having a rescue inhaler with a dose counter. With May being Asthma Awareness Month, I’m excited to announce the launch of the Know Your CountAsthma Pledge. During the months of May and June, we are encouraging people to visitand simply click a button to make their Asthma Pledge. For every pledge received, Teva Respiratory will donate $1 to the Consortium on Children’s Asthma Camps in an effort to help send deserving children with asthma to summer camps nationwide. Nice Work , "Good Website"